Los Angeles to Orange County IT network cable installation. Emergency? 24/7 Call For Fast Repair. Troubleshooting. Best, Proven Los Angeles area network cabling, structured cable planning, installation, drop work contractor. We bring you the entire range of IT network cabling and voice wiring services. Every job GUARANTEED, AFFORDABLE, LOW COST. Save money, be worry free. Expertly serving all Los Angeles and Orange County. 24/7 emergency service – call when you need help at any hour. Your go-to Los Angeles team for business, IT and home residential network cabling, or voice or fiber optic installation. 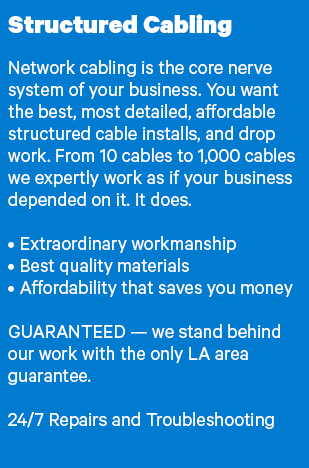 We are LA’s best structured cable data network cabling installation company – with top reviews for extraordinary work and pricing. 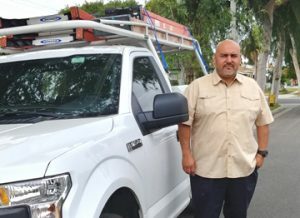 Louie and his team are your battle-tested and affordable choice for all services relating to cable or wiring installation and maintenance. Call us now, or use our convenient job Request For Quote form. Our expertise and experience covers all businesses and new home or existing home projects. We understand you need a very responsive and responsible LA contractor team to do your network cabling or voice wiring work. Need it fast? We do that. Very very good, demonstrably superior work with the highest quality materials? We do that. On budget? We are affordable, with our low costs compare favorable to our competitors and that saves you money and increases your quarterly bottom line. We’re reliable, as our customers tell us often, and in this business reliability is critical. We plan, install, maintain or troubleshoot all your data center, company IT or office, retail business or residential data jobs – no matter how small or sophisticated. Our team is tight, and extremely experienced in all fields of IT or other cabling and wiring – including low voltage, Cat 5, Cat 5e, Cat 6, structured, infrastructure, voice and more. 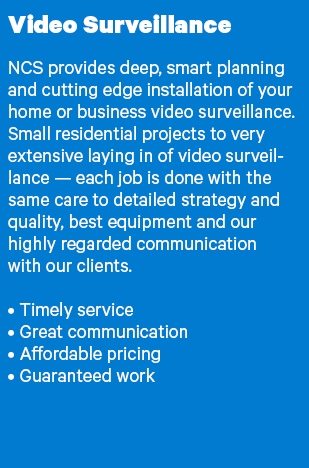 We enjoy a reputation in the LA area as being very responsive, very good in client communications, and our fair fees save you money you can put elsewhere. IT Data centers to business office and retail or warehousing buildings, our team covers it all, and we’re responsively fast – 24/7 for emergency needs. For Orange county network cabling installation – we’re always there for you, fast and reliably. IMPORTANT: We GUARANTEE our IT network cabling structured and infrastructure work or voice wiring installing. Every day we work hard to be the local LA and Orange County area’s leaders in communication, job performance, best quality materials and follow up support. We plan projects with your precise needs and budget in mind. We only use the highest quality hardware. We install your cable with detailed engineering exactness. All with your budget in mind and keeping in close touch with our excellent customer relations. Our intent is to do the best quality job with the best quality materials—small to large. For Your Los Angeles Fiber Optics Cabling or Wiring Needs, call us today, or use our RFQ submission form. Network Cabling Emergency Services in Los Angeles – call us right away if you have an emergency. 24/7 emergency services. We pick up the phone at all hours. Put us on your mobile contact list so our number is handy. FREE QUOTE – so call or email us today, and we’ll get back to you fast. Repair and Troubleshooting Needs? For the highest quality, fastest and cost effective 24/7 repair and troubleshooting, call us right away. We understand how critical repair or troubleshooting is for your operation, and we’re here to rapidly respond with our best people. See our complete support roster of Services here. "Louie and his crew from Network Cabling Systems replaced all the computer network cabling throughout our building. 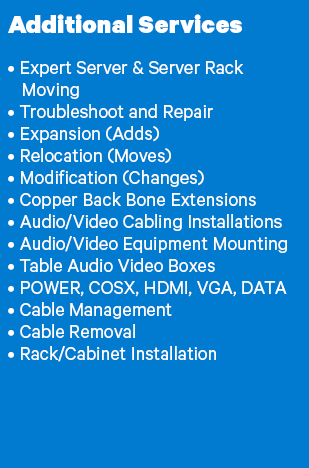 I have had dozens of contractors do various jobs at our building over the years and I can say with all honesty that working with Network Cabling was by far our best experience. They provided an easy to read bid and answered all questions. They showed up as scheduled and did a fantastic job installing the cabling, labeled everything, tested everything and cleaned up after themselves. I would not hesitate to hire them again." 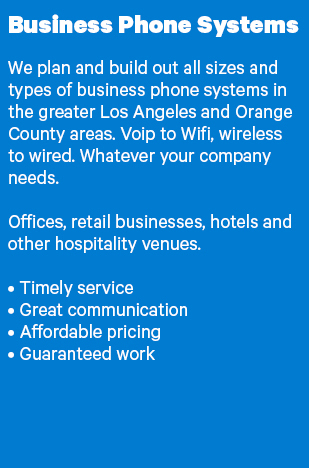 We’re known as the best Los Angeles (LA) and Orange County IT network data cabling (Cat 5e, Cat 6, etc), drop work, structured cable, low voltage, and all wiring services contractor company. Affordable, guaranteed implementing of commercial business network and voice cable infrastructure and communications work. In business since 2004. No other company offers the quality, intelligent (guaranteed) approach and technical support we bring to each job. Repair and troubleshooting also. Affordable. Low cost. In Los Angeles. Orange County. California. CA.